 This is the lunar sequence from Hythe (3 March 2007). Hi guys its stefan here we meet up at ally pally here are a couple of photos from the eclipse hope you enjoy, if you are board one day check out some more of my photos at www.stefan42.f2s.com, was nice to meet you both, catch you next time. 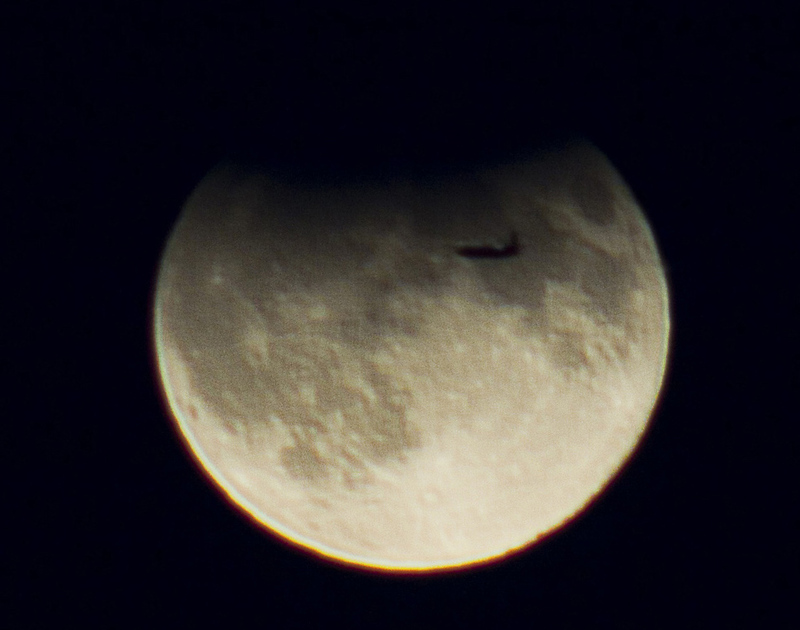 Partial Lunar Eclipse from Alexandra Palace in London with plane (7 September 2006). Regarding the 1988 Total Solar Eclipse event which was observed by the thousands over at General Santos City in the Philippines in March of that year, it was probably incidental that I was one of the thousands who flew to this southern Mindanao city as a member of the Eclipse Expedition undertaken by a team from the Philippine Astronomical Society, Inc; the Physics Department of the University of the Philippines; and the Manila Observatory. Our Team actually occupied the roof deck of the Gen. Santos City Hall which you mentioned in your article. I had set up my tent right there (the only tent up there besides the shower room, if you remember). I also happened to meet personally the late Roger W. Tuthill who generously distributed samples of his mylar filters for our telescopes. I am happy to note of your positive views about the Philippines in general, as provided by your experiences with our hospitable people. Your positive comments about my country as reflected in your article will hopefully contribute to the enhancement of our tourist industry, especially in this southern part of the country. I had a great time in the Philippines and still get letters from some of the people I met then. Of course, since that eclipse I have seen [several] more. I was looking for information on the Paraguana Eclipse of 1998 because I am from Punto Fijo and I was very young and could barely remember some details of that wonderful day. Thank you for all your work, you have made my day! By the way, the crooked tree you stood under is called Cuji and I bet you know is crooked because of the wonderful and strong wind from Paraguana (I live in Texas now and really miss my home). Anyway, I thought you'd want to write down the name of the tree in your website. All these pictures and stories brought back memories that I want to share with somebody that loves eclipses so much like you and your team. I remember me and my family were away from the city in Santana because my family has property over there is in the country. The roof of the back porch was tin roof and had some holes. the holes would always give some rays of sun to the floor, very circular but the day of the eclipse when the moon was partly covering the sun we could see a semi-circle instead of the full circle of light we were used to see. I also remember that we were outside seeing the eclipse and the goats started walking toward their stable as soon as it was getting dark, some of them didnt have time to get there so they laid down under trees, looking for some shelter because they probably thought it was time to go to sleep, isnt' funny? Well, thank you so much again for reading my little stories, I hope you understand my grammar. Thank you again for the beautiful pictures. With much respect. KryssTal Reply: Thank you for writing. We enjoyed our visit to Venezuela and our stay in Punto Fijo. I will update our web page with the information about the Cuji tree. How do you tell the exact time that an eclipse crosses a particular country. For example, the Mar 29, 2006 path crosses a corner of Egypt at Sallun. How do I find out the time of totality? There is a web site where you can download tables about any eclipse. Find the latitude and longitude of the location and read the eclipse circumstances from the table. Do not hesitate to write again if you have any further queries. You are dealing with a complete astronomical novice here. I don't understand what UT is. I don't understand how to find the latitude and longitude of the location and read the eclipse circumstances from the table. For example...I'm trying to understand the time that the Mar 29, 2006 eclipse will pass over the tip of NW Egypt. Can you walk me through how I can figure this out? The area in Egypt where the eclipse will be total has a latitude of 31.5 degrees N, and a longitude of 25 degrees E. These figures can be found from an atlas. The eclipse will be total around 10:40 UT. UT is London time or Greenwich Mean Time (GMT) which is the scientific standard. Egypt is 2 hours ahead of GMT so locally the eclipse will be total at around 12:40, just after noon. More accurate times will be available closer to the time. hi, I just visited your webpage. KryssTal Reply: Thanks for that. I've just come back from seeing the 2002 eclipse in Botswana. I like your pages. You could submit your eclipse page to The Eclipse Chasers' Web Ring (which I run). I remember the Coke advert poster. Just got in from Capetown on Saturday [23 June 2001] at 12:30 in Kansas after almost 24 hours of assorted travel by land, air, train and vans. Excellent eclipse. 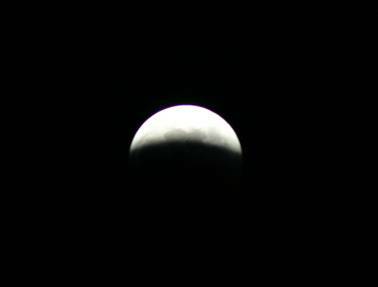 Eclipse observations location: Karubwe near Chisamba, North of Lusaka, Zambia almost near centerline. GPS coordinates: 15� 05.5935'S, 28� 14.317'E. altitude 3698 I think. the town was (yeah) I recall that it was 2.4 off the centerline. weather: Near perfect- no clouds, some smoke from some local fires on horizon. 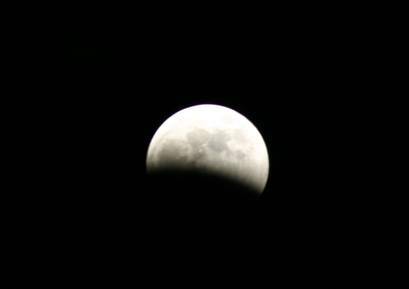 with Panasonic digital- 900: digital video footage of the corona and outgoing diamond ring and tried to photograph shadow bands after 2nd contact. with Kodak 290 camera: Pictures of ring of fire, eclipsed sun in the background pictures (TIFF files for advanced processing and printouts). (3) saw shadow bands for the first time after 3rd contact and they lasted for more then 3 minutes. (I am analyzing my video to see if I caught them). (3) Cape of Good Hope, Seal Island and Penquin beach. (4) Safari ride and animals. In the meantime, please let me know if you have accounts, photos, videos or more about what you saw. Fill out the form below and send to me for posting on my site. I am also looking for photos of eclipse t-shirts, stamps you collected, original rhymes poems, drawings, emotional writings (short) about the eclipse.Permission for link at Black Sun Eclipse. Joel K. Harris, President Twilight Tours Inc.
A short note to you. As you probably know and find familiar, I, along with Fred Espenak, am one of the leading amateur eclipse chasers in the world. I suppose that in a sense, Fred is "Mr. Eclipse East" and I am "Mr. Eclipse West", being stationed out here in the west coast of the U.S. I just wanted to compliment you, on a very, very fine site. I actually am somewhat envious of what you have erected here, as my site (www.sciencecenter.net/twilighttours) is rather "toned down", purposely, to allow those with non-DSL/broadband WWW access a rather fast "paint" time for getting the information I want to impart. However, that said, again, you really tell the story very well and I salute your efforts, Kryss. Funny thing. I was just reading your story about the Venezuelan eclipse in February of 1998. You mentioned Dan Koehler of [then] Astronomy magazine. Dan was on my expedition to Punto Fijo, along with about 50 other folks from the U.S. It was a "Zoo" there on the beach, and we were actually rather scared about the "fireworks" as we thought it was actually GUNFIRE from the locals on the site. BTW, our very big, very macho bus drivers wept during and after the eclipse, they were so moved by the sight. I also, concur, I too have never see the sky or planets look like they did that day, in the 14 eclipses I have seen over 30 years. It was like looking at a live planetarium/orrery in the sky.... Just amazing/awesome. Again, a fine job on your site..... Take care and Clear Skies. By a coincidence, we met Dan Koehler again a year later in London at the Astrofest. My wife recognised him: "that's the chap with the sand". It must have been your tour bus we got a lift back to Punto Fijo on. Someone gave us a tin of Coke, so thanks for that. A lot of people have told me that the 1998 eclipse was one of the most spectacular. 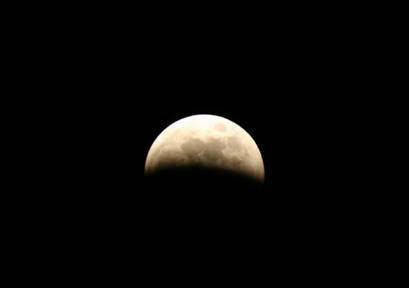 I was talking to the author Patrick Moore in Cornwall (1999) and he'd seen the same eclipse from the islands off the Venezuelan coast and he stated it was the best for colours. 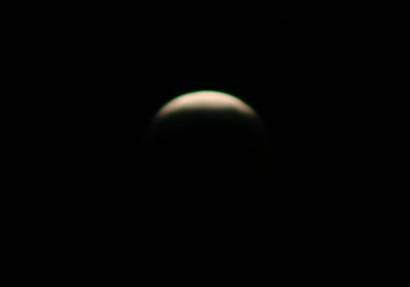 Having just moved house, I may not be able to make the Antarctic eclipse. I just saw your photography of the world page. Very nice! I'm green with envy! I had seen your work before but didn't make the connection. . . I ran a search in Altavista +"total eclipses" +"nazca lines" and it was the only site that came up! I guess the URL for my Nazca Lines site hasn't been processed yet. Maybe I will resubmit it to be sure that it gets done. I have to ask. Could you possibly let me use some of your photis in my Web-Sights? I'm afraid I can't afford to pay you anything substantial but I would of course credit you and provide links to your pages. I am in dire need of good photos of the Nazca Lines but it is likely that you also have photos of Mayan and Aztec art that could be useful too. Could you look over my sites and let me know if you think you can help me with pertinent images? So far it looks like my only realistic option for joining the Eclipse Web-Ring is to create a duplicate 'Treasures of Darkness' page in Netscape Composer and download it as a seperate file. I am happy for you to use my images (credited of course), there are some of a Mayan pyramid in Mexico and some of the Mayan descendants in Guatemala. When you have sorted out your web page with the eclipse ring, let me know and I'll add you to the ring. If you change the file name, we can edit your details accordingly. Your site looked interesting when I checked it our before. I'll be returning soon for another look. Hi Kryss, You're as bad as I am for messing around on the Web well past your bed time! 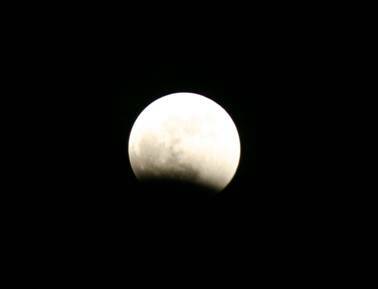 Our eclipse in Hungary was glorious- the prettiest one I have seen. I also completed a beautiful video of the shadow coming in , the corona, diamond ring and more. Meanwhile I have posted my account and the poem I had published in astronomy magazine, dec.1999 issue on my site. if you want to add a direct link. Many thanks. Great job with the eclipse webring.